Recognize the need to extend EE to collage students who are on the threshold of becoming active participents in society, as citizens, decision makersa and leaders. The importance of extending EE to college students on the threshold of becoming active participants in society as citizens, teachers, decision-makers and leaders, has steered CEE over the years to evolve its Higher Education Programme. This initiative is significant in light of the Supreme Court ruling on introducing courses on Environment at all levels of higher education, and the University Grants Commission's subsequent recommendation to all universities to introduce a compulsory foundation course at the undergraduate level. 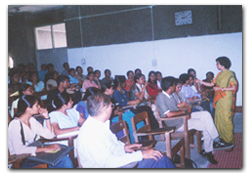 As part of its Higher Education Programme, CEE develops programmes and instructional material for college students and teachers. In collaboration with institutions of higher and professional education, CEE designs and delivers tailor-made courses to the students. A pioneering project in the development and institutionalization of a curriculum in EE for pre-service teachers has also been undertaken.